TurboFire uses High Intensity Interval Training (HIIT) fire drills, high-energy kickboxing drills and sculpting exercises with brief periods of rest to burn 9x more fat then traditional cardio. 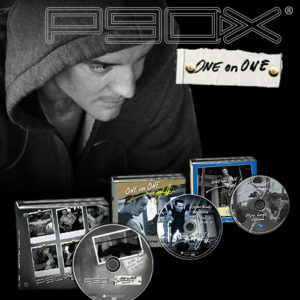 Order now and get 2 bonus Turbofire workouts; Ab Igniter and Greatest HIITs bonus DVDs, a $29.99 retail value. BeachBody has provided Intense Fitness with a limited supply of these bonus TurboFire DVDs. We are giving them away with each order of the TurboFire workout. You Ready For TurboFire’s HIIT? TurboFire uses High Intensity Interval Training (HIIT) “fire drills”, high-energy kick boxing drills and sculpting exercises with brief periods of rest to burn 9x more fat then traditional cardio. Are you ready to feel the fire? An introduction workout to master the TurboFire moves as Chalene breaks them down for you at a slower pace, so you can be ready for the HIIT classes. Don’t let the “low” fool you, these high intensity workouts ignite the AfterBurn Effect to help you keep burning calories. Fire introduces longer cardio classes to melt away fat while recovering from the high intensity HIIT classes. Get ready to burn and give your max for 1 minute intervals during these classes, which allow you to burn calories for up to 24 hours after your workout! Learn how to ignite your TurboFire programfast. The “Fuel the Fire” nutrition guide is loaded with easy to prepare recipes, healthy snaking options and tips to help you make the most out of your workouts. Designed to help users stay motivated, ask questions, get answers and get new ideas from the TurboFire community. It’s around the clock access to fitness experts and peer support. If you’re a fan of Turbo Jam, then you’ll love TurboFire, Chalene’s intense new total body conditioning program. 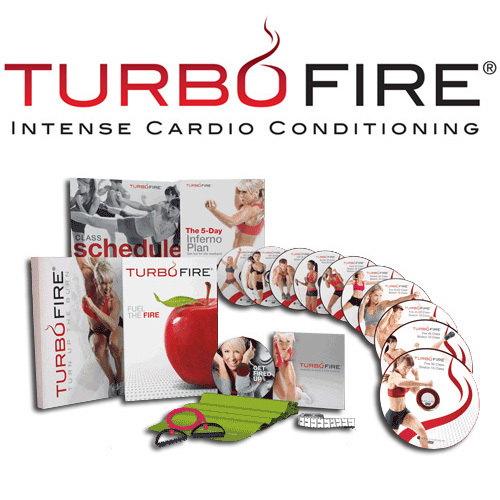 TurboFire uses High Intensity Interval Training (HIIT) “Fire Drills”, which include high-energy kick boxing drills and sculpting exercises with brief periods of rest to burn 9x more fat then traditional cardio. High Intensity Interval Training or HIIT is a form of cardiovascular “cardio” exercise beneficial to burning fat by utilizing short and intense workouts. Short bursts of intense workouts, also known as “Fire Drills” in TurboFire, help to increase post-exercise oxygen consumption, as your body continues to break down fat and burn calories at a higher rate as it recovers from exercise. Chalene calls this the “AfterBurn” Effect. It means you keep burning calories for up to 48 hours after your workout.